If you are an avid cook, then the kitchen is definitely your domain, and you loathe anyone who might come up to take over your place, never mind that their cooking skills are on par with yours. Of course, having a sense of humor in a place where things could get hot pretty quickly would also come in handy, and this is where the $14.99 Ham ‘n’ Eggs Kitchen Set brings some comic relief there. Instead of serving breakfast, let breakfast serve you! 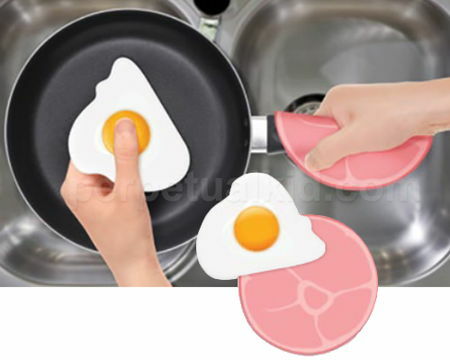 The Ham ‘n’ Eggs Kitchen Set is made to please, with the “ham” slab being really a heat-resistant silicone pot holder and trivet, while the nylon “fried egg” happens to be the ideal pan scraper.